With National Aboriginal Day and Canada Day just behind us, it feels appropriate to bring up a Canadian hero who resided within the ephemeral identity lines of both the First Nations and the English. A half-Mohawk, half-English performance artist, E. Pauline Johnson took on the guise of her second self, Tekahionwake (one of its possible translations meaning “double life”). She ensnared theatre goers all over Canada, England, and the U.S. from the 1890s-1910s with her naturalistic poetry and strong stage presence. Costume changes between buckskin leather and sweeping gowns visually set up Johnson’s inverted prose that effectively broke down stereotypes involving Native Indians, particularly Native women. Johnson’s legacy was recently rekindled in a piece titled “Double Vision”, published in The Walrus’ July/August 2012 issue. In the article, author Emily Landau ties Johnson’s poetic politics to the first stirrings of feminism in the late nineteenth-century and reassesses the artist’s literary significance in the present day. Landau concedes that Johnson’s poetry wasn’t ground-breaking; however, focusing strictly on the quality of her imagistic writing misses the point. As Landau cleverly points out, the reactions Johnson stirred in her audience are equivalent to the scandal surrounding pop icons of the present moment, including Lady Gaga and Madonna – two fearless female artists who incite mayhem with every move. But all is not lost for those who’ve missed their chance to see Pauline Johnson perform by about hundred years or so, as her legacy lives on through written word. 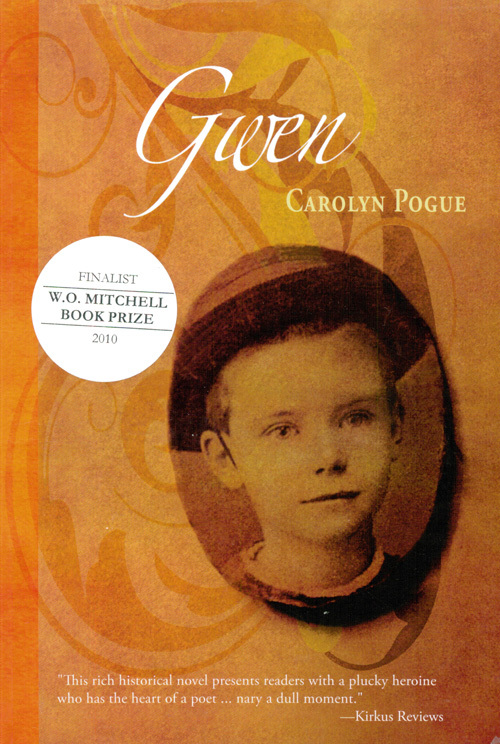 Carolyn Pogue’s historical fiction, Gwen, is one prime example. The novel follows a young girl named Gwen who is taken to a Girl’s Home after her father passes away. Memories of her late father and a final birthday gift from him, a book of poetry by Pauline Johnson titled, White Wampum, help Gwen persevere through trying times and see every experience as an adventure. Ever since Gwen had the opportunity to see Pauline Johnson perform on stage, she’s dreamed of visiting Canada. Johnson’s visual poems are Gwen’s daily hymns, soothing midnight lullabies, and a constant source of inspiration for Gwen’s desire to act out her own grand narratives on stage. O! Sleep, my tired eyes have need of thee! For those intrigued by the beautiful excerpts of White Wampum scattered throughout Gwen, the entire contents of the book are accessible to the public on Canadian Poetry Press’ website here. Not only is Gwen a fantastic historical source with its references to Yonge Street, the St. Lawrence River and national heroes including Miss Johnson and Joseph Brant, it’s also a captivating story of a young girl determined to pursue her dreams and traverse new lands. Gwen is young, but her sensibilities and optimistic character are bound to evoke emotions from all age groups. Pogue’s exciting follow-up to Gwen is titled, West Wind Calling. The novel continues the thread of Pauline Johnson’s importance to the main protagonist as Gwen ventures to Western Canada and even has an encounter with the performance artist herself. West Wind Calling is set to hit book shelves in August 2012. In the meantime, be sure to check back for regular updates and more content about Gwen. This entry was posted in Uncategorized and tagged Canada Day, Carolyn pogue, Gwen, National Aboriginal Day, Pauline Johnson, poetry, The Walrus, West Wind Calling, White Wampum. Bookmark the permalink.